Perfect for the buffet. Set 1/8 fold disposable custom printed paper dinner napkins out at your buffet table or at each guest place setting to celebrate the recent graduate. 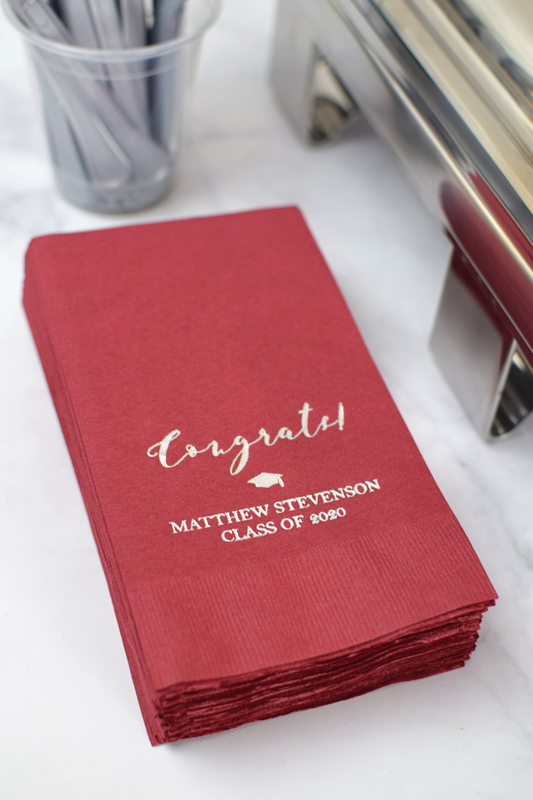 Custom printed with a fun, graduation design and your own special message to guests. Napkins are rectangular in size and measure 8 1/4 inches long by 4 1/2 inches wide and are made from 3-ply, non-recycled disposable paper. Makes clean-up a breeze! Your guests will love the extra thought you put into your party details. I really like these napkins. They looked great & were durable. I will order these again for my other son's graduation in a couple of years. Not what I ordered. I ordered kiss my class goodbye I got the tassel was worth the Hassel. Shipment arrived day before the event so had to go with it at least the colors were right. TippyToad Response: Customer received full refund per our 100% satisfaction guarantee.